The Israeli amateur radio satellite was TechSAT 1B (GO-32) was launched with TO-31 from the Baikonur Cosmodrome in Kazakhstan on 10-07-1998 . The inclination of the satellite is about 98° on a sun-synchronous polar orbit at an average altitude of 820km and an orbital period of 101 minutes. The transmit power is 1 Watt (3 watt optional). Gurwin-TechSat satellite, By its basic characteristics belongs to the micro-satellites sub-class, with mass of 50 kg and designed as a multi-purpose platform, suitable for the space research. TechSat was equipped with 6 different devices, to carry out the on-board scientific experiments. All of them were repeatedly run during the flight, according to their respective programs. 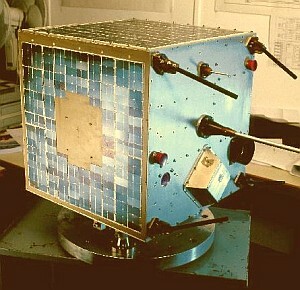 Till recently, one of them was operating non-stop (Detector of the Particles), three were periodically turned on and off (Super-conductivity Experiment, Earth Imaging System, and X-Ray detector), one failed after 10-month successful operation (Ozone Meter), and one was used only in the early phase of the mission (Laser Retro-Reflector). On-board experiments and measurements were presented in the numerous publications. We give here a brief description of satellite payload in-orbit performance, illustrated with some of the obtained results.